Why I Bleed Family Medicine! was the bars. These were places where the stigmatized individual could let down their guard, be accepted and be told they are good enough just as they are. Creating a collective identity (“I am not alone”) helps individuals feel empowered against stigma. Transgender individuals have not had this. How isolating. How lonely. In addition to this social isolation is the constant bombardment from almost all aspects of society telling you that who you are is wrong and not good enough. First, examine you own feelings and biases you may have toward transgender patients. Are you creating an accepting and supportive environment in your office? Being an accepting provider and office will help lessen the shame a transgender patient may have about their identity and will help them better cope with the effects of stigma. Second, become knowledgeable about resources in your area and in the state to provide appropriate gender-affirming care for your patient(s). In the July issue of The Journal of Family Medicine there is an excellent article written by my friend Dr. Abbas Hyderi and his colleagues on providing sensitive care to transgender patients (Hyderi, 2016). Start educating yourself today. Third, support changes to policies that reduce stigma and provide equal opportunities for transgender people. Studies show that policy changes can positively impact the lives of stigmatized individuals by providing greater protections and access to resources under the law. And finally and most importantly, let you patient know they are good enough! Works Cited Hass, A. R. (2014, January). Suicide Attempts among Transgender and Gender Non-conforming Adults. The Williams Institute. Hughto, J. R. (2015). Transgender stigma and health: A critical review of stigma determinants, mechanisms, and interventions. Social Science and Medicine, 147, 222-231. Hyderi, A. A. (2016). Transgender patients: Providing sensitive care. The Journal of Family Practice , 65 (7), 450-461.
went well beyond what we believed would be reasonable, and the NCAFP’s advocacy team and physician leadership put significant efforts into changing the proposal. t’s all over television. It’s in the newspaper. It’s in the Legislature and in Congress. In fact, you can hardly turn around without hearing or seeing something about the opioid crisis in our country. There is certainly a need for appropriate pain management, and for years, physicians have been told that pain is the “fifth vital sign.” Yet, there are those who abuse opioids, as well as other prescriptions or illegal drugs. The Academy is working hard to help our members address this important issue and continue to provide appropriate pain management to their patients. The following outlines a few of the developments in North Carolina and beyond, and provides a few resources that may be helpful to you in your everyday practice. Ultimately, the legislature adopted a proposal requiring all prescribers to register with the Controlled Substance Reporting System but it allows you to use your best clinical judgment for when you should access the system. However, you will need to register for CSRS within 30-days of obtaining or renewing your medical license. We would encourage you to register now rather than waiting for your license renewal. If you are not already registered with the system, you can find out details and the form needed to complete registration at www.ncafp.com/csrs-register. The legislature also funded upgrades to the system that should make the CSRS more user friendly to physicians in the future, and ultimately provide the ability to interact with registries in adjoining states going forward. examiners resulting from drug overdoses. ment and paired its release with a free webinar discussing how to evaluate patients presenting with chronic non-terminal pain to assess for potential opioid responsiveness and opioid risk. The toolkit includes an action plan, pain inventory, work questionnaire, medication agreement between patient and physician, an opioid risk tool and links to additional AAFP and external resources for physicians. This is another excellent resource with timely and evidence-based information. May, the AAFP formally launched a major educational initiative known as MACRA Ready designed to inform members on the law’s ins and outs. In North Carolina, the NCAFP has already incorporated MACRA learning sessions into its conferences and is planning additional segments on MACRA and value-based care strategies in its future meetings. all payments. While MACRA spells out a yearly .5% increase to Medicare’s base schedule until 2019, each physician's performance or the pathway they follow will dictate their own payment increases after that. From years 2026 onward the base schedule will again increase at different rates depending on the payment pathway, but the same rule applies for tomorrow's Medicare: incomes will be driven by outcomes. ing paragraphs review both paths, highlighting their key differences and aspects. Please note that given the breadth of MACRA and each payment pathway, not all specifics are listed; comprehensive information for family physicians can be found at www.aafp.org/macraready. Activities (CPIA). CPIA will seek to quantify patient access, patient engagement, population health management, care coordination, and patient safety. Each of these measures will be combined in different percentages based on payment year to calculate a physician’s Composite Performance Score (CPS). During the first two years of implementation -- 2019 and 2020 -- the Secretary of CMS is authorized to set the performance threshold. In subsequent years, this threshold will be the mean or median of composite performance scores during the previous year. Each physician's payment adjustments to Medicare Part B -- bonuses or penalties -- will be based on their performance relative to this threshold. The most nerve wracking, yet promising part of the MIPS pathway is what it will mean for physician payments. Each physician’s payment adjustments will have the potential to be sizeable, ranging from as high as a 27% positive adjustment for very top performers to as much as a 9% penalty for those in the lowest 25% percentile. Any physician meeting the established performance threshold will experience 'stable' payments at the established fee schedule. However, MACRA clearly states that any positive and negative adjustments to physicians be delivered in a budget neutral fashion (with the exception of top performers). As a result, there will be winners and losers in this new payment game. The most immediate consideration for physicians concerning MIPS is getting ready for performance scoring, a process that CMS is scheduled to begin in 2017. Scores that CMS will gather will build a physician’s composite score and affect their payments in 2019. The AAFP has been actively lobbying CMS for this initial performance year to be moved to either July, 2017 or preferably 2018. Short of any change, however, the AAFP and the NCAFP are advising practices to prepare as if 2017 will be an important measurement year. Beyond these aspects, there are a specifics related to MIPs eligibility that may preclude some physicians for having to participate, like overall Medicare payment volume, and participation year. See AAFP's MACRA Ready webpage for additional information. The Alternative Payment Model MACRA’s other payment pathway is the Alternative Payment Model or APM for short. The APM is marked by more stringent participation criteria and more attractive financial awards. At a high level, the APM pathway requires physicians and providers to be a ‘qualifying APM participant’ by satisfying three specific requirements. These include practicing within a qualified APM model as listed in the MACRA legislation, meeting certain eligibility requirements as they participate in these models, and attaining a volume threshold of Medicare patients or Medicare payments. If each are satisfied, the APM provides automatic payment incentives of 5% each year through 2024, no risk to MIPS-based payment adjustments, and incentives based on a higher fee schedule going forward. First, several models qualify as advanced practice models according to the MACRA legislation. These include a Medicare Shared Savings Program (MSSP), an expanded CMS Innovation Center Model, a Medicare Healthcare Quality Demonstration model, or a demonstration required by Federal law. Within these types of models, additional eligibility criteria must also be met according to CMS. These include the reporting of quality metrics similar to MIPS, requiring the use of certified EHR technology, and either bearing ‘nominal risk’ or being classified as a medical home expanded under the Center for Medicare & Medicaid Innovation. Current models that meet these requirements include any Medicare Track 2 or 3 Shared Savings Program, a Next Generation ACO Model, a Comprehensive ESRD Care (CEC), the Comprehensive Primary Care Plus (CPC+) program, or the Oncology Care Model. Last, a provider (or a provider’s group) must also reach certain volume thresholds in either Medicare payment or patients through the model to be a 'qualified APM participant' according to CMS. In 2019, this percentage is set to be 25% of Medicare payments or 20% of patients. Enough Am I In A Patients or Qualifying APM Payments? Am I In a Qualifying APM? First Year in Medicare or Below Volume Treshold? Keep in mind that specifics of each payment pathway continue to be finalized by CMS. CMS issued draft rules in April that will be finalized this fall. See more on this process above. another mechanism for increasing revenue to support needed transformation investments. There's also transformation help available to practices with fewer than 15 eligible providers or those operating health professional shortage areas. Each can receive free technical assistance through NC's QIO and Regional Extension Center. Practices can also draw on the services of CCNC’s Practice Transformation Network that's currently getting started across the state as well. tion. The AAFP responded with a lengthy analysis of CMS’s proposal and communicated its perspectives on several key issues. AAFP's central point in its analysis was how critical it is for CMS to implement MACRA ‘as thoughtfully, carefully and as simply as possible’ given the law's wide ranging effects on the healthcare system. Chief among AAFPs concerns is the proposed delay in the implementation of ‘virtual groups’ designed to enable small practices to join together for the purpose of MIPS performance scoring. In addition, AAFP is urging CMS to simplifythe rule and move the measurement date back at least six months if not 12 months. At the time this article was being written, CMS had begun to hint that their implementation schedule may change, and members of Congress were pushing to simplify the rule. However, final details will not be done until sometime this Fall when CMS actually releases the final rules governing MACRA. Stay tuned. n the past year, you have probably heard about “The Practical Playbook,” an effort to advance collaboration between public health and primary care to improve population health. In fact, this publication highlighted the effort in our Autumn, 2014 edition (p18). The effort is a collaboration of the CDC, the de Beaumont Foundation and the Department of Community and Family Medicine at Duke University. The initiative has developed both web and printed resources that give very practical guidance to help further the collaborative efforts of public health and primary care. I say all this as a precursor to an overview of how the NCAFP intersects with public health almost on a daily basis. From having Board members and other leaders involved in public health (Dr. Shauna Guthrie, the medical director for the Vance-Granville Health Department and Dr. Jennifer Mullendore, the medical director for Buncombe County Health and Human Services are just two examples) to your staff’s regular interaction with the state Division of Public Health, overall public health efforts permeate the work of the Academy. In fact, public health is really interwoven with almost all of our key strategic objectives. Let me take a few minutes to explain. indicating that they know a friend or family member who may be at risk for an opioid overdose. The move is somewhat unprecedented, basically giving the state Health Director authority to prescribe for anyone throughout the state. Yet we advocated for it as a commonsense approach to helping combat the epidemic of opioid abuse in our state and nation. On the legislative front, we have also supported efforts to obtain funding for the state’s “Healthy Corner Store Initiative,” an effort to bring fresh fruits and vegetables to food deserts that lack traditional grocery stores or other sources of healthy food. Whether it is our “Health is Primary” campaign efforts last year or revisions we are now undertaking to our communications plan, much of what we have discussed really centers around making the pubic healthier. Just one example is our work with the NC Colorectal Cancer Round Table. That group has targeted key areas of the state with either a large number of cases of colorectal cancer or a high incidence of colorectal cancer. We are helping connect the state and the American Cancer Society to local physicians in these targeted areas to improve public education and increase the screening rate for colorectal cancer. You may have heard of the 80-by-18 Initiative. Its goal is to increase colorectal screening rates to 80 percent by 2018, and our state still has a long way to go to do so. In these particular target areas, students from the UNC School of Public Health will be undertaking community scans this fall in order to develop a game plan on how to better communicate the risks of colorectal cancer and how screenings are a key way to prevent or minimize bad outcomes. • The NC Prescription Drug Abuse Advisory Committee • Talk It Out NC, the NC Initiative to reduce underage drinking • The NC Public Health Association And many, many more. Public Relations and Marketing Another area of our strategic plan that intersects well with Public Health is public relations and marketing. Our overarching goal in this strategic area is to educate the public and key leaders on the value of primary care and prevention. The NCAFP will continue to be involved in communication efforts just like this one. We will work to amplify messages through our communications to you (our e-newsletter, NCAFPNotes and this magazine), but we will also use our social media platforms to highlight areas of concern just like the need to increase colorectal cancer screening. And these efforts will continue. Managing a population requires a broader look at the community, the environment and more. So once again, public health and the work of the NCAFP align nicely. Our primary goal for our Membership & Workforce Council is increasing the pipeline of primary care physicians to the most needy areas of our state. This summer, the NCAFP is helping provide nearly 30 medical students with clinical experiences between their first and second year of training. 20 of these medical students are participating in a two week rural program based in eastern and western NC, that includes shadowing a rural family physician for a week and working with a residency program for a week. We hope these experiences will attract the next generation of medical students to rural and underserved areas of the state. Typically, many of the public health crisis areas in our state parallel areas with both physician and other healthcare provider shortages. Dr. Elizabeth Baxley, a professor of Family Medicine and the Senior Associate Dean for Academic Affairs at the Brody School of Medicine at East Carolina University, has been elected as Chair-Elect of the American Board of Family Medicine. Dr. Baxley has served ECU since 2012, but previously spent 18-years at the University of South Carolina School of Medicine where she was Residency Director, and also Chair of the Department of Family and Preventive Medicine. With her election, Dr. Baxley will serve the ABFM on the Executive Committee, the Bylaws Committee, the Credentials Committee, the Examination Committee, the Audit/Finance Committee, the Research & Development Committee as its Chair, and the Certification Committee. We also have been involved in another non-profit’s efforts -- Med-Serve -- to attract students to rural areas. In this case, 12 recent college graduates have been paired with medical offices in rural counties. For the next two years, they will serve as Medical Assistants or other support staff in these clinics, ranging from Federally-Qualified Health Centers to Rural Health Centers to private clinics. During their orientation program, we helped provide speakers on the value of primary care and the business of medicine to this outstanding group of learners. The 12 individuals selected this year represent a wide range of universities from Yale to Brown to Duke to UNC, NC State and UNC-Pembroke. All of these students hope to ultimately enter health professional careers, and we (along with the leadership of Med-Serve) hope they will serve underserved and vulnerable populations. Two medical students actually developed the program, modelling it after the “Teach for America” initiative. You can learn more about this effort at www.med-serve.org. 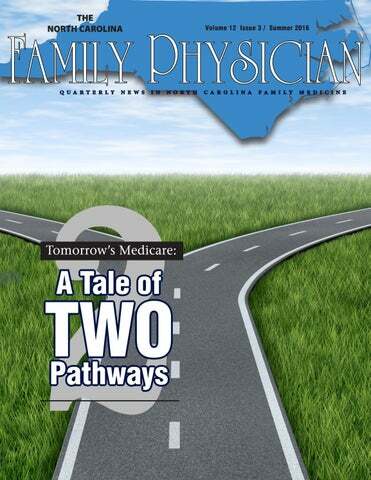 The bottom line, we are continually working to build the pipeline of future family physicians to care for our most vulnerable citizens throughout the state of North Carolina. CME/Education And certainly last but not least are our efforts around Continuing Medical Education. Many of our educational programs have a public health slant, and some of our faculty comes from our engagement with public health. Whether the topic is cancer or something as specific as cardiovascular disease in firefighters, much of our ongoing education also comes with overall population health and public health in mind. Prevention. Public Health. Primary Care. Population Health. Maybe rather than ABCs, we just should have the Ps of healthcare. It’s pretty simple: without a greater emphasis on these areas, we will never be able to lower cost and improve quality. But I believe we can meet that aim right at the intersection of family medicine and public health. Changes to National AAFP CME Requirements The AAFP Board of directors recently approved a change to the AAFP’s CME membership requirement. Previously, members could claim a maximum number of credits for individual activities such as published research, clinical research, paper presentations, exhibit presentations, medical writing, peer review, and writing test questions. Effective immediately, these activities can be reported simply as scholarly activities and will qualify as Prescribed credit. Members may claim a maximum of 100 credits in this area per re-election cycle. As a reminder, AAFP members must also obtain a minimum of 25 credits from live learning activities every three years to meet the AAFP’s CME membership requirement. If you have questions about this CME requirement change, you may email the AAFP at aafp@aafp.org or call (800) 274-2237. Answers to common CME questions may be found online at www.aafp.org/cme. You may also view/update your CME transcript and determine your re-election cycle at this site. CME and Camaraderie In the Perfect Location During the Best Time of the Year! You might still be breaking in this year's new flip flops and enjoying the summer months, but we are already in full-swing with the planning of our annual Winter Family Physician's Weekend scheduled for November 30 - December 4th at the Omni Grove Park Inn in Asheville, NC. Attended annually by over 700 family physicians and primary care providers, this event is one that you definitely do not want to miss. Hosted in the beautiful Blue Ridge Mountains during the best time of the year, it's the perfect kick-off for your holiday season! expert guest speakers, this year's schedule includes 25+ AAFP Prescribed Credits on several evidence-based lecture topics including Dermatitis, What's New in Pharmacology, Diabetes, Sleep Health, Social Media & Healthcare, Asthma, Novel Therapies for HFrEF, Hepatic Encephalopathy, Physician Wellness, Adult Immunizations, Transgender Patients and much, much more. Watch our conference website (www. ncafp.com/wfpw) for updates and information on the many optional CME Workshops also being presented. Timely and requested CME workshops include a SAMS Study Working Group, Skin Biopsies, Common Sleep Disorders, Practice Management 201, and Mastering Joint Injection Procedures. Additional CME and non-CME opportunities are still in the planning stages, so watch your email for updates and information. including a candlelight tour at our national treasure, The Biltmore House. Enjoy a special afternoon-getaway in the Grove Park Inn's award-winning spa or grab your favorite beverage and relax by the giant fireplace in the Great Hall. Saturday evening includes our Presidential Gala when we install Dr. Charles W. Rhodes as our 20162017 President and our new Board members. To help us celebrate, we've invited back one of our favorite bands, Too Much Sylvia. Come dressed in your holiday best and bring your dancing shoes! Please visit our conference website at www.ncafp. com/wfpw for additional schedule details and conference information. Or, contact Kathryn Atkinson, Manager of Meetings & Events, at 919-833-2110 (800-872-9482 NC Only) or via email at katkinson@ncafp.com. Got FM Research? Participate in the NCAFP Foundation’s 2016 Research Poster Presentation The NCAFP’s 23rd annual Research Poster Presentation will be held this December during the Academy’s Winter Family Physicians Weekend (Dec. 1-4, 2016). Research posters may also address any topic relevant to family medicine, including practice-based research. Judging categories include family medicine residents and medical students. Complete details including online submission can be found at the NCAFP website at www.ncafp.com/poster-presentation. here are you in 5-10 years? This is a question most residents had to answer since the first medical school interview. As physicians in training, we are accustomed to thinking extensively about the future: the next class, shift, rotation, or year. Becoming a physician involves anticipating the outcome of a 10-year trajectory, after accounting for pre-med courses, medical school, and residency. The answer is likely constantly changing with the stage of training as we discover what we enjoy in family medicine. The trajectory of 5-years after July 1st of your intern year will look significantly different than July 1st after graduation. Preparing for “the rest of your life” can often seem daunting, but it doesn’t have to be overwhelming. Here are some of the things we have learned along the way. PGY1- PGY2: Dr. Alyssa Shell The choice to practice OB, sports medicine or palliative care may only become clear after experiencing these fields. For all you interns out there, don’t fret too much about figuring out next steps – a lot will become clearer simply by walking the path. At the same time, three years of residency can blow quickly by, turning small chunks of elective time into crucial laboratory experiments: How jazzed do you really get about colposcopy? Does developmental pediatrics pull at your heartstrings? With limited time, a strategy for weighing diverse interests can help make the decision making process easier. the things you want during your residency, you have to offer a compromise. Discuss these things as early as possible; it is likely that 2-20 other people’s schedules may need to change. As family medicine people, we tend to be fairly reasonable and understand that there is a world outside of our hospitals and clinics. Still if you need time out for any reason - babies, families, or mental health - it helps to be willing to add time on in other ways - weekends, nights, or added time. Being proactive in work-life balance is a part of professionalism, and does not stop after residency. As hard as it seems, it is important to include those things you enjoy in life now. Somehow during intern year I managed to work out 5-7 days. I completely lost this habit second year, and picked it back up again this past year. I am much happier and a more reasonable person when I’m dancing. It makes me a better doctor. Mentors are indeed helpful to clarify your path. Anyone can be a mentor. If someone is doing something you are interested in, seek them out. Others will volunteer if you make your desires known. As soon as I finished my Behavioral Health rotation my second year I started talking about a 4th year fellowship. The more I talked about it, the more people either directly wanted to be on my team, or were able to guide me to others to join. By the time I was in my 3rd year I had a working team to discuss, consult, and organize with the revitalization of my residency’s Behavioral Health Fellowship. Discussing my goals frankly with attendings allowed for improved feedback and actual steps to help me obtain my goals. There are projects and opportunities available, but you may not hear about it unless others know your interests. Similarly this allows people to join your projects. I started to make a fuss about including social justice into our didactic curriculum around the end of my first year; now we have a whole committee across multiple divisions working to make this happen. Where will you be in 5-10 years? You may not know now, and that is fine. Use your time in residency to explore medicine. Mentors can help guide on the way. Include experiences that are important to you. There is a life outside of medicine and sometimes that requires compromise. Let people know what you are interested in, and sometimes mentors come to you. Your vision will change over time. So often we are looking for the next transition event (e.g. residency graduation). However in medicine there is no clear destination, it is always a journey. Family medicine allows for many twists long the road. I am unapologetically an idealistic social justice doc, who bleeds family medicine. It’s imperative I continuously try to build a path for myself that allows me to wake up every day feeling joy and love for my part of the work it takes to make the world a better place. I hold myself accountable to feel that joy so I can add productively to the village I have committed and invested myself to live, work, and play in. Physicians Alliance (NPA) and Doctors for America (DFA). She helped to build a national coalition of community organizers, politicians, physicians, health professionals and labor unions, to dynamically capitalize on and foster the growing momentum of the country to improve health access. These experiences led her to a family and social medicine residency program at Montefiore Medical Center. She loved residency and as she says, she rocked it! Following residency Dr. Sharma's first job was with Evergreen Health Care, an affiliate of Evergreen Health Cooperative, Maryland’s only non-profit health insurance cooperative, authorized by the Affordable Care Act. There she was the first Medical Director and designed a comprehensive primary care team model to serve its health exchange population, she served as the clinical lead in building Evergreen’s four health centers from scratch. Dr. Sharma then moved on to serve as a clinical innovator for Iora Health, a mission driven, integrative primary care and technology company, which values "blowing up status quo primary care" and being a health disruptor. Iora created a 3-pronged unapologetic approach to primary care through their innovations in: payment, technology and most importantly their care model of delivery. Her charge has been to build a physician and nurse practitioner pipeline that fosters a culture that cultivates trusting, meaningful relationships with patients and communities with true collaborative team-based care. Care where everyone’s touch to a patient is just as important, if not more important than a provider to create a mission of true service with humility. Dr. Sharma hires for attitude and invests in training for skill. She leverages strengths of team-based care and looks for the right docs who believe and can act on that mission. Elections for new Student and Resident leaders will take place during their respective business sessions on Saturday, December 3, 2016 at the NCAFP Winter Family Physicians Weekend in Asheville, NC. NCAFP’s Student and Resident sections each elect a Director-Elect to the Academy Board of Directors and two students and two residents to serve as Trustees on the NCAFP Foundation Board of Trustees. Deadline to submit materials for these elected positions is November 15, 2016. Steinkamp suggests focusing on theCenter in West Virginia who were prescribed la The case involved 29 patients from Mountain Medical “power of relationships” rather than on controlled substances for pain caused by accidents or workplace injuries. The patients became addic direct lines of authority. “Physicians can subsequently engaged in criminal activities, as fraud, take steps to humanizesuch themselves, educate theft, forgery, and doctor shopping. The pl vs. dictate, for input, and(e.g., thus increase physicians and three pharmacies for ask negligence prescribing large quantities, allowing for early r influence through ‘soft power.’” resulted in these damages. Follow up with a patient’s other physician and other caregivers. I confirm that I have not given any false health facts and am not seeking treatment under false agree to release my doctor and his/her staff from any liability caused by or due to my misuse THE NORTH CAROLINA FAMILY PHYSICIAN • Summer 2016 drug(s). About CPEP ns for palliative care CPEP (www.cpepdoc.org) is a 501 ause the legal ramifications of (c)(3) organization that promotes quality patient care and safety by enhancing the competence of physicians and other healthcare professionals in all 50 states from its offices in Denver, Colorado and Raleigh, North Carolina. CPEP offers focused courses on communication in the clinical environment, prescribing controlled drugs, and professional ethics as well as comprehensive clinical competence assessments. Bill O’Neill, MBA, is Director of Communications and Outreach for CPEP based in Raleigh, NC. Mr. O’Neill has an MBA in marketing and finance from the Wharton School of Business and has spent much of his career in the health care field. At CPEP, he manages the organization’s eastern U.S. operations in Raleigh while focusing on outreach to licensing boards and medical executive committees throughout the United States and Canada. n last quarter's article, I wrote about automated practice scheduling as one way to extend value to patients and help practices realize the full potential of an electronic patient portal. In this segment, I will discuss enhancing digital patient communications and engagement as another key strategy. about boundaries. If patients are being overly verbose or using the patient portal in an inappropriate manner, then we re-explain our expectations about proper use and the behavior generally changes. Some patients will continue to call instead of messaging. We usually respond to them through the portal and remind them to use the portal for future inquiries. Problems can also occur if patients fail to read their portal messages. But evidence shows that 97 percent of messages sent through a mature patient portal are read by their recipients in a timely manner.4 Compare that with the number of phone calls you make that are never acknowledged, and you will see that secure messaging is an arguably safer way to provide information of low to moderate risk to patients with Internet access. We also encourage portal use by not doing refills by phone. Patients can use the portal to request a refill, which is routed to my medical assistant, or they can contact their pharmacy, which will electronically request the refill. This can be another good starting point for offices trying to increase portal interaction, as well as a good way to dramatically improve office flow. (See “Annual portal activity for 1,000 patients.”) By using the portal for scheduling and secure messaging, we conservatively estimate that we save at least 10,000 phone calls annually. Reprinted with permission from the AAFP. Dr. McNeill is a family physician and owner of Trillium Family Medicine in Asheville, N.C. He would like to thank John Bachman, MD, Allen Wenner, MD, and Robert Geist, MD, for their guidance in improving this article, and Sue Stigleman for her research assistance. care based on what they have told us. Third, documentation is made much easier because the patient’s IMH output populates the subjective elements of the progress note. More than two-thirds of the word count in a patient record is related to the patient history. Having this information already gathered means I do not have to interview the patient and type at the same time. Instead, I can maintain full eye contact with the patient as I review their information during the consultation, which increases patient satisfaction. After the visit, I have less documentation to complete. These features allow me to comfortably meet the needs of my patients with only one medical assistant and negate any need for a medical scribe or transcriptionist. In addition, any time saved is money saved. A word about electronic visits: I do offer online consults, usually for simple acute complaints that can be safely handled without a face-to-face visit, such as urinary tract infections, poison ivy, or colds. Only one insurance carrier in our market will pay for them, so we generally bill patients a $35 fee. We ask our patients to fill out a portal interview regarding their chief complaint, and I respond with my care recommendations within two business hours. Demand is not that high; I provide only one or two a month. Electronic visits may be more helpful in busy offices with access problems, but our patient-centric portal-based workflow increases availability significantly. If you’re a medical professional in your late 30s, 40s or 50s, you’ve probably started dreaming about retirement and started doing some financial planning to get there. But the question I pose to experienced doctors is, “Are you saving efficiently so you can retire with confidence as soon as possible?” Most, though they don’t want to admit it, aren’t sure and that’s not surprising. It takes time to understand the small nuances of financial products. And if there’s one thing I know from growing up in a physician household, it’s that most physicians don’t have extra time. You’re working long hours saving lives, diagnosing patients, keeping board certifications up to date, and sharing experiences with loved ones. I recently helped a busy couple who are both physicians to build a full picture financial plan. They had saved well, but they had failed to consider risks like longevity, health care costs, long-term care and more. Perhaps the biggest item they hadn’t considered was the impact that taxes could have on retirement accounts. Together, we identified a smart balance of investments across pre-tax, taxable and tax-free investments to help keep them in a lower tax bracket in retirement. They were not alone in the sense that many individuals don’t realize that retirement income is just like earned income, it’s all about what you can keep after April 15th. This simple solution helped them to save more efficiently and effectively for retirement. Practice Tracks New Blue Cross PCHM Incentive Program Designed for Independent Primary Care Practices Blue Cross and Blue Shield of North Carolina (BCBSNC) has launched a new program designed to help independent primary care practices transition to PCMHs. The program offers upfront financial incentives to practices under BCBSNC's standard fee schedule that commit to reaching PCMH-recognition within 15-months. Practices that successfully complete the PCMH recognition process then become eligible to participate in BCBSNC's Blue Quality Physician Program, a program that also provides enhanced payments. If you would like to learn more about this program or have other questions, contact BCBSNC at pcmh@bcbsnc. com or call 919-765-1292.
private insurers will pay you to provide oral preventive care to young children? Find out more how to participate. is resuming regular revalidation cycles going forward. CMS sets every provider’s revalidation due date for the end of a month and posts the upcoming six months online at data.cms. Wisconsin to conduct CFTR mutational analysis as well. should contact Ann Grush at 919-807-8881. Family Medicine Practice Opportunity in Wilmington Board certified family practice physician in established practice with M.D. and two Physician Assistants in Wilmington hopes to retire sometime in 2017. We are seeking another board certified physician to take over the practice which is an outpatient practice open Monday-Friday 8-5. Telephone call only rotated among three providers. Solstas lab drawing station, practice owned XRAY and EKG on site. If interested, call 910-793-8738 evenings/ weekends. If you are a job seeker, post your resume anonymously. Create job alerts. And do it all in less time than it takes to search through job postings on the mass job boards.